For families in need, having access to healthy food and personal care items can be a daily challenge. My husband and I do our best to show our kids how important it is to give to people in need. We do service projects through scouts such as adopting a family for Christmas where the whole pack will pitch in money to buy the family presents and food gift cards to help them have a happier Christmas. We donate coats to those in need in the winter. Our pack does Feed My Starving Children to pack food for kids overseas that don’t have any food. On a family level we have them put money in the collection plate at church. We will buy a burger for a homeless person and we’ve even helped give homeless work in the past when we lived in Florida. Champions for Kids, General Mills and Unilever, have joined forces to make it simple for communities to provide basic resources for their students through donation opportunities. According to the 2010 U.S. Census, over 16 million American children live in poverty. This means that in addition to being hungry, millions of children lack other basic items they need to thrive. In fact, Feeding America reports that families who struggle financially often make difficult trade-offs: nearly three in four (73 percent) of low-income families have cut back on food in order to afford products such as personal care and baby care items. Research from the National Scientific Council on the Developing Child shows that food insecurity is linked to poorer performance in school and increased illness. 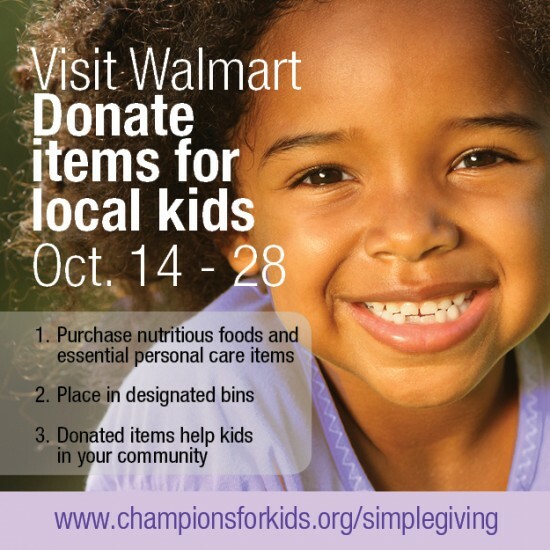 Between now and October 27 you can visit your local Walmart and place purchased food or personal items inside a bin for the Champions for Kids program. All donations will stay in the local community and be distributed through school districts nearest to each store. Champions for Kids, General Mills and Unilever are awarding school districts in each participating Walmart division that collect the most donated items. What kind of ways do you try to help out your community by giving back? I love how easy Walmart makes it to help in your community. We volunteer to pick up litter in our town and donate to the food pantry a few times a year. I love this so much. There are so many kids in need out there, and this is a great way to help them. 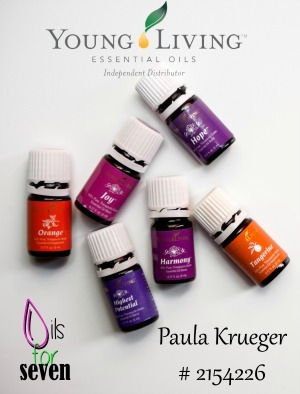 What a great program to help! I love how Walmart helps our community. I love to see big companies like Walmart helping to give back to families in need. This is a great initiative, and I’ll be sure to pick up some items for the drive. I think it’s so great that Walmart is giving back like this. There are so many people out there in need, and we need to do all we can for them. They didn’t want to be where they are. Love Champion for Kids, I have worked with them in the past. Such amazing programs to help our children. We’ve always donated clothing to needy families as well as new toys. Everyone deserves a merry Christmas. It’s important that as a country we work together to help the children of America! Thank you for posting this! Champions for Kids is such a great cause…and is so easy to give to. Thank you for reminding me about them. This is a great charity! I love Walmart is giving back to others! There are so many families in need out there. I love what Walmart is doing to help them. Great. Great program! I was just there today but next time I go, I’ll remember this and donate. I’ll be on the lookout for the bins when I’m at Walmart. We usually help out with the March of Dimes through my husband’s work and this year I’m helping a friend raise money for his kidney transplant. This sounds like a great drive. I love being able to help those in need. There are so many needy kids out there, I’m always glad to see a big company like Walmart giving back. This looks like a great campaign. We donate food every month to our local food bank. It is terrible that so many people go hungry when we have so much wasted food that gets thrown out every day. This is great! 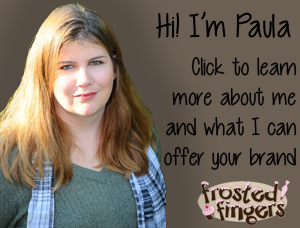 CFK is the BEST! Has the best programs!!! I have to head in there this week so I’ll look for that bin. I love the program! this is a great program. i’ll certainly add an item next time i shop. I’m going to look for those bins the next time I’m dong our family’s shopping. I like to give when I can. I’m currently organizing a big clothing swap for the community! I love that Walmart has a program like this!